Msgr. William Lynn was ordered to return to jail Thursday, May 1 after a hearing that recalled elements of the landmark 2012 trial that resulted in his conviction on a child endangerment charge. It was the first conviction in the United States of a high-ranking church official in the clergy sexual abuse crisis. The hearing came three days after the Pennsylvania Supreme Court reversed a December 2013 state Superior Court decision on Msgr. Lynn’s appeal that had freed him on bail from the State Correctional Institution at Waymart. 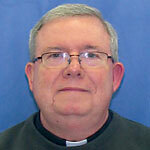 The former secretary for clergy of the Philadelphia Archdiocese from 1992 to 2004 had been living under house arrest since early 2014 at St. William Rectory in Northeast Philadelphia. Judge Teresa Sarmina, the same judge who presided over Msgr. Lynn’s trial in 2012, also presided over the hearing last week. Philadelphia Assistant District Attorney Patrick Blessington, as he did during the trial three years ago, squared off again with defense attorney Thomas Bergstrom. Sarmina sided with the prosecutor in revloking the bail of Msgr. Lynn, 64, and remanding him to prison Curran-Fromhold Correctional Facility in Northeast Philadelphia. After processing he is expected to be transported back to Waymart, in northeastern Pennsylvania.